I came across Synology DS418 reviews online, and I got interested in this device because it has the features that I was looking for in a cross file sharing platform and backup solution. I am running a small business, and it is essential for me to have a storage solution which I can use to share files with my employees and for data backups as well. For business operations to be efficient, there is a need to utilize the use of various tools and technologies that will help in its different activities. Fortunately, even at a fraction of a cost, there are business solutions that are made available even for small businesses. This means that there is no need to spend a lot for the company to be provided with the hardware and software that it needs. 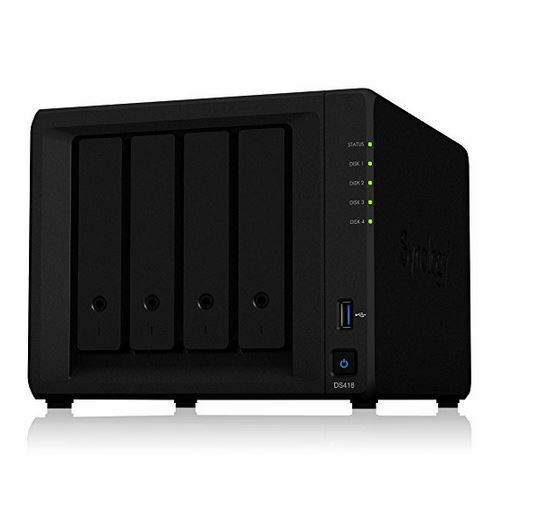 Synology DiskStation DS 418 has been designed with small and medium-sized businesses in mind. These businesses, needless to say, require a network attached storage solution that is high on performance, easy to use and is full of useful features. According to DS418 reviews its firmware, DSM 6.2 is excellent and works fast. It is not unusual to have read speeds of over 220 MB per second which is quite impressive. This makes it ideal for a quick file or data transfer. One of the things, why many consumers prefer the Synology DS418 over other storage solutions like Synology DS218, is because it is rich in features. You will be able to host your own websites, have an email, photo and music servers and access media streaming to name a few. This storage device streams 1080p video and provides users with excellent documentation. It also works quietly making it very pleasant to use. What’s more, you will be able to use your iPhone with your DS 418 as well. It is worth noting that these features are more familiar with a server that with a system such as the DS418 and perhaps this is the reason why it costs more than other similar NAS units in the market. The Quad Core performance can be considered as one of the most important benefits that can be enjoyed by the people using this product. It is equipped with a powerful processor that is excellent when it comes to speed. It also has support for USB 3.0 that delivers the assurance that it can be able to transmit data without lags. Also, this model is also beneficial in terms of its features. This is made possible by the DiskStation Manager that offers multiple choices when it comes to the different applications that can be used by the enterprise. Some of the perfect examples of such include webmail, video surveillance, and antivirus, among others. When it comes to installation, there is also another apparent benefit from this model. It is almost effortless to accomplish. Users will not need to sweat to have such completed, and it will not even require technical knowledge. Aside from the comprehensive instructions that are provided by the manufacturer, there is also the Web Assistant feature that makes it possible to complete the setup in the absence of any complications. It does not require a lot of time to install this DiskStation in your network. It is even more quick and easy process if you have worked with RAID arrays before. No big deal if you have not. Then we suggest you read a couple of articles about RAID systems before setting it up. Some guides are available online which will help you to get an idea about types of RAID arrays. When you have decided what kind of RAID system you want to build, there is not a lot of work needed to install the DiskStation DS418. Majority of consumers have rated this storage system highly in their reviews. They are especially impressed with the quiet operation of DS418 and quality and functionality of its software. Consumers said in their reviews that Synology DS 418 is solidly built and is packed with useful features and applications. There are a few though who have complained about its price. It is more expensive than other similar products, but then again, it would be worth paying extra for it because of its impressive construction and characteristics. 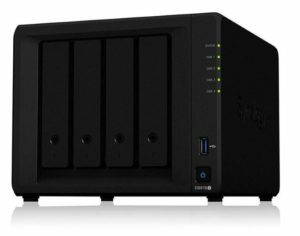 If you are looking for a 4 bay NAS for your home, you should also check out 4 bay model comparisons, but if 4 bays are not enough for you, then you should check out the Synology DS718+. 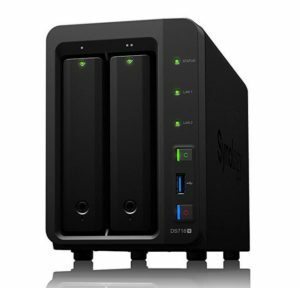 To see all models from DS 41x series that are available read article about available Synology Disk Station DS4xx models. Click on the link below to check out the cheapest diskless model prices and complete features list. In many of the reviews that have been published about this NAS model, it is common for its users to put an emphasis on the fact that it has an interface that is easy to navigate. Regardless of the feature or the application that will be used, it is sure to be free from any complicated. It will be easy to explore what else it can offer, even for novice users. Besides, there were also many users who reported that they like how it is lightning-fast, which makes it one of the most excellent when it comes to speed amongst the alternatives that can be found in the product category. It is also highly responsive, which reduces lags that are often experienced in other models. Lastly, another reason why people like this model is that it is able to promote the security of information shared over the network. This means that users should never be worried because they can be guaranteed that only the authorized parties will have access to the data that is kept in the system. This is very important, especially if there is confidential information. Regardless of the useful features and exceptional performance that has been experienced by many, it is inevitable that there are also some issues encountered by other users. There were some who did not like the fact that it is almost entirely a made of plastic material. There were also concerns raised about the high throughput of the folders that are encrypted.